Well, it isn’t dead, but if you think about it, a plant that already looks dead even when it’s alive has a lot going for it. When Calvin Coolidge died, Dorothy Parker said, “How could they tell?” The ocotillo is like that. If it makes it through the winter, fine; if it doesn’t, well, that’s fine too. I suppose if I lived in a hot desert I’d grow nothing but plants that looked dead half the year. 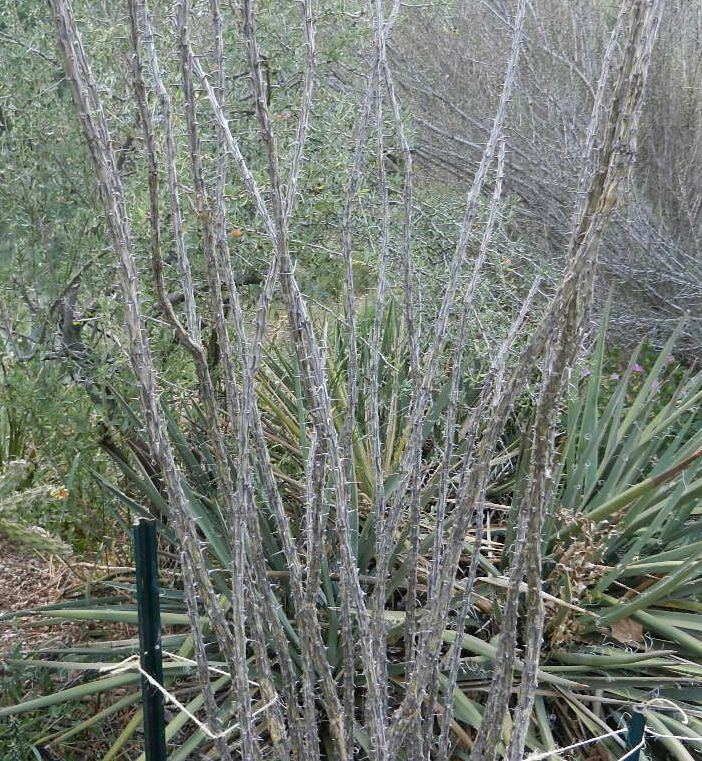 (An ocotillo can look dead for a very long time. I grew a dead one for years.) I have a dwindling collection of such plants, pachypodiums, commiphoras, burseras, etc., that look dead most of the time, growing in the upstairs bedroom. Sometimes they do die and I don’t notice it for years; I keep watering them in the winter or spring, and eventually it dawns on me that the plant has passed on. Or I just keep watering them, wondering why there are no signs of life. Gardening doesn’t get any better than this. This entry was posted in Uncategorized and tagged Fouquieria splendens, ocotillo. Bookmark the permalink. I guess I’m going to have to be careful not to read your blog after my husband has fallen asleep. He did’nt appreciate my laughing out loud. It was slightly less funny when a huge gust of wind came up and blew over my bargain-basement ocotillo about five minutes after I got it into the ground. I decided to stake it, after that.